Why Do I Need to Clear My Store's Cache? What can I find in the Store Module section? How do I edit my information on the 'Contact Us' page? What does the site’s search bar look for? What time did this order come through? How can I have the coupon code window on my checkout pages? How can I block a Specific IP Address from accessing my Store? Can I Track My Store’s Inventory? What is the Abandoned Carts Notification module? How do I Integrate PowerReviews? Why aren't my RSS feeds working? Why doesn't my Quick Search work? Why can't I list more than 100 Home Page Special items? What is the QuickCart feature? How do I enable Recently Viewed Items on my store? How is the Daily Deal feature used? How do I use the Group Deal feature? What is the 3dFeedback Feature and how do I use it? How do I set up Customer Group Security? How do I Set Up and Use the Affiliate Program? What's the difference between Single Page and 3-Page Checkout? How do the Autoresponders work? Can I change the date and currency format used on 3dcart? How do I enter product weights in Kgs instead of Lbs? How does anonymous checkout work on my store? How do I use reCAPTCHA on my site? How do I use the Gift Wrapping Module? Why Am I Being Logged Out Of My Online Store Manager? How Do I Upgrade My 3dcart Plan? 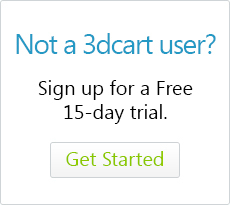 Can I Use 2-Step Verification On My 3dcart Online Store Manager?